We've been walking in one of the most beautiful, sunny and hot weekends in the mountains and it has been absolutely glorious! Despite the seemingly endless hot weather, we all know mountain weather is completely unpredictable and summer in the mountains is never all sunshine and blue skies. 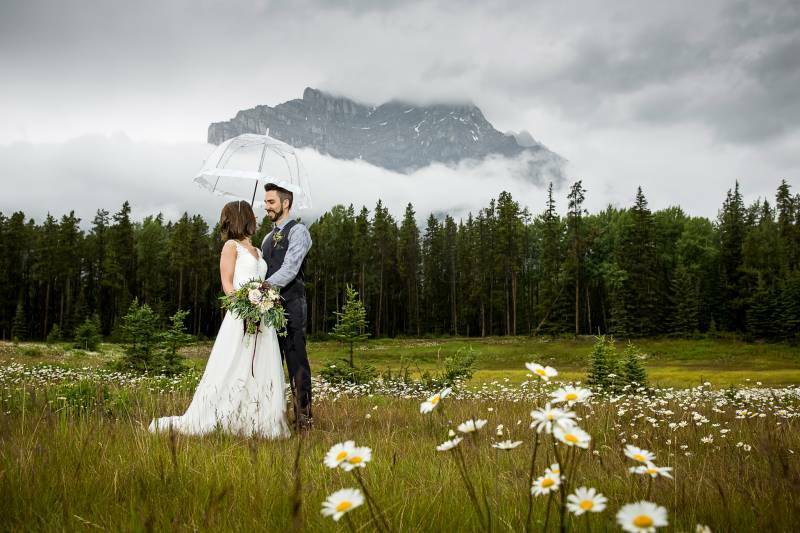 Kaleigh and Adam were married last summer in Banff, but the weekend brought unexpected rain and weather for their big day. However, these two made the most out of everything and the wedding turned out absolutely perfect! Today we get to show you a glimpse of their gorgeous summer wedding through the lens of Banff wedding photographer, Kim Payant Photography. Sharing her work is always a treat and we are excited to share this rustic and elegant wedding with you today. Adam and Kaleigh wanted to celebrate their love for each other in the gorgeous Rocky mountains with a rustic and elegant wedding that brought together their closest family and friends. 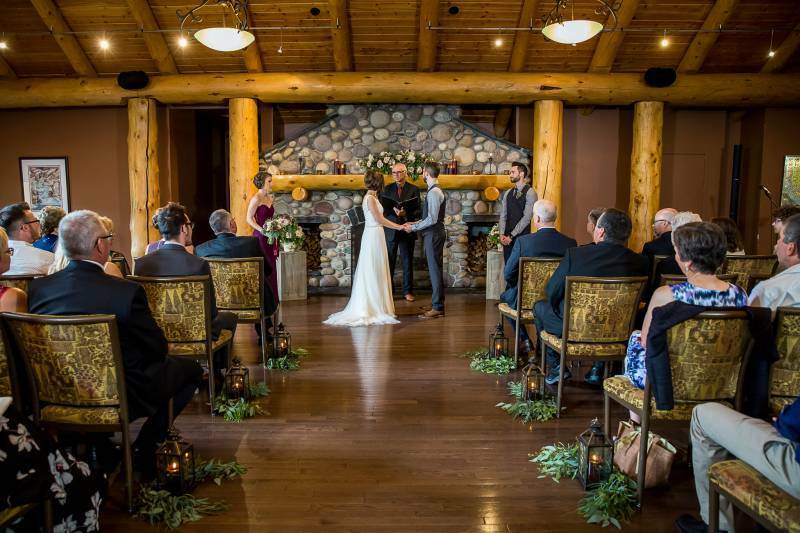 They decided on the beautiful Buffalo Mountain Lodge in Banff as their wedding location and with the rainy weather, it worked as both the ceremony and reception venue that day. 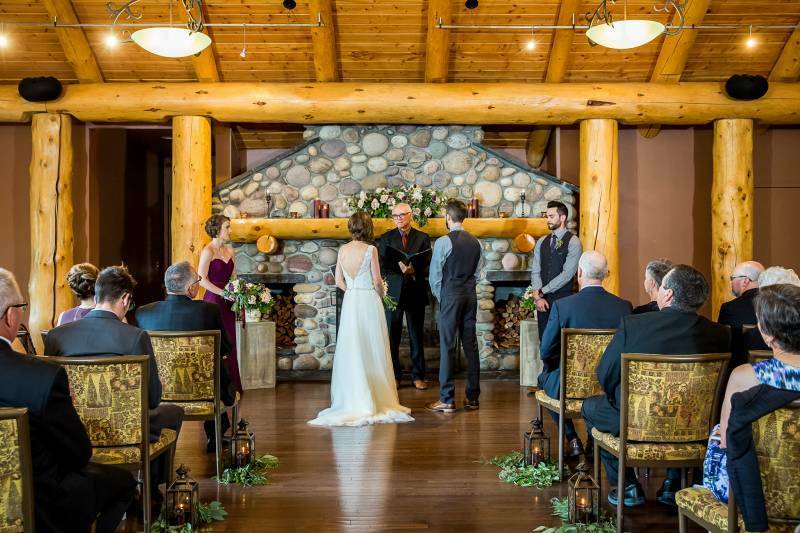 The wedding colours were chosen to add warmth and depth to the rustic lodge and Kaleigh worked with a palette of plum, burgundy, ivory and sandy colours along with a lot of greenery to provide balance and a more natural feeling. Willow Flower Company designed a stunning bouquet within the colours and framework of Kaleigh's vision and the results were absolutely breathtaking. The bouquet felt elegant and natural all at the same time and was filled with so much depth and texture. 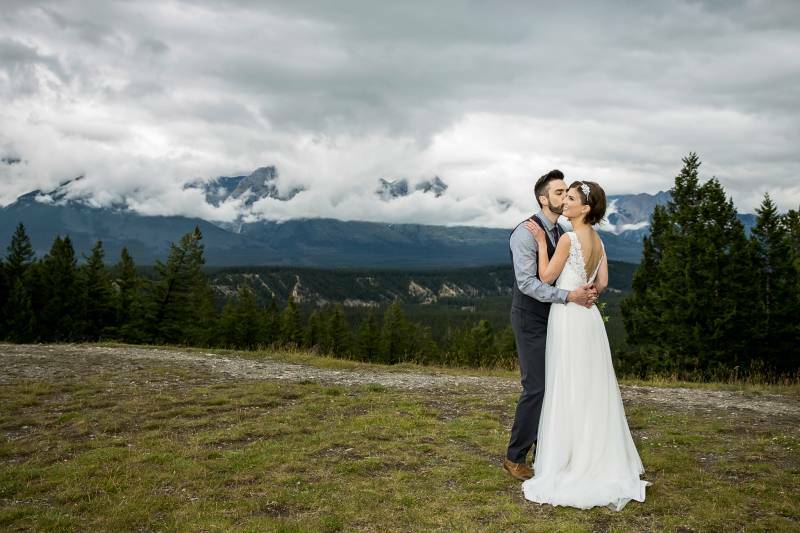 After a beautiful ceremony in front of the fireplace, the weather cleared up enough for Kaleigh and Adam to head outside with their amazing Banff wedding photographer to capture a few moments of just the two. The clouds danced around the mountains creating the most incredible backdrop and showing us how beautiful mother nature is in any weather and they captured remarkable photos I'm sure they will cherish for years to come. 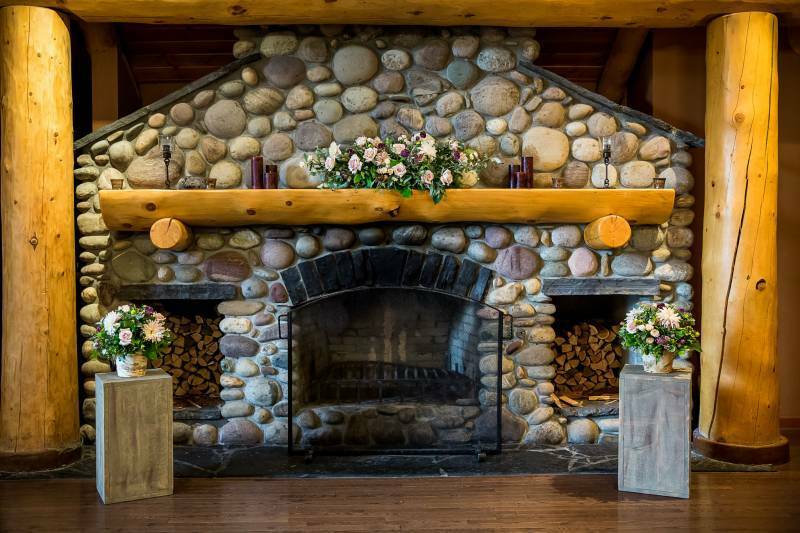 The Banff wedding reception was held back at Buffalo Mountain Lodge and was filled with rustic, mountain-inspired touches like antlers, birch trees, hints of burlap and beautiful greenery. Cake Creations baked a delicious wedding cake topped with soft buttercream and fresh flowers that complimented the rustic decor perfectly. 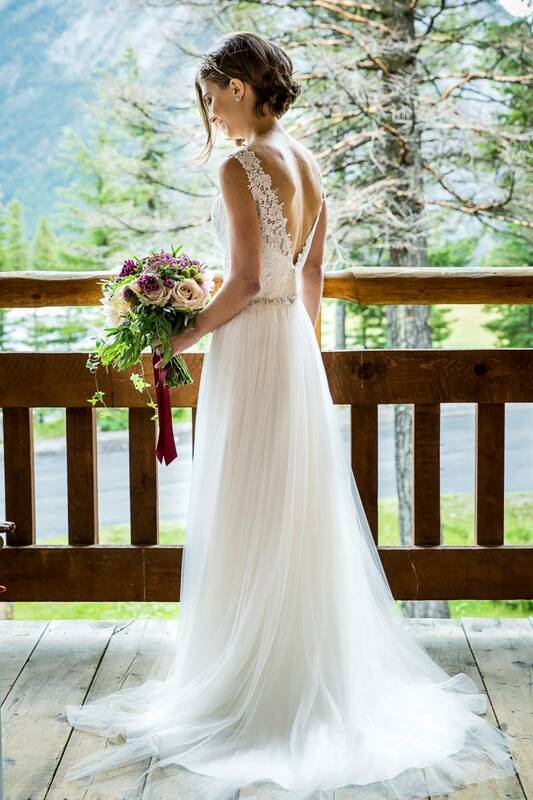 A huge thank-you to Banff wedding photographer, Kim Payant Photography for sharing this gorgeous wedding with us today through her beautiful photos. 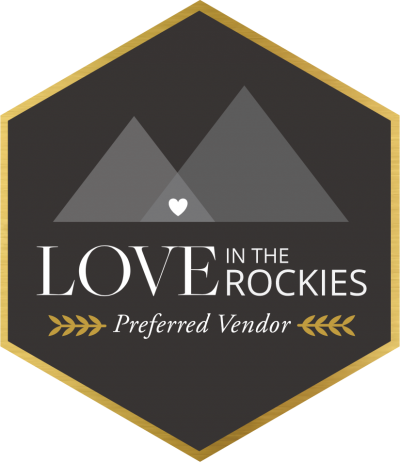 Kim Payant is a wedding photographer you must check-out if you are getting married in the Rockies, her background in fashion photography and love of adventure and the mountains translates into incredible wedding photos. Be sure to check-out more of Kim Payant's wedding photography work here.